Active – Select to show the vendor on the website. Name – Enter an internal name for the vendor. Use lower case characters and enter dashes instead of spaces. Required field. URL - Enter the direct URL for the vendor. Title – Enter the vendor’s business name. Required field. 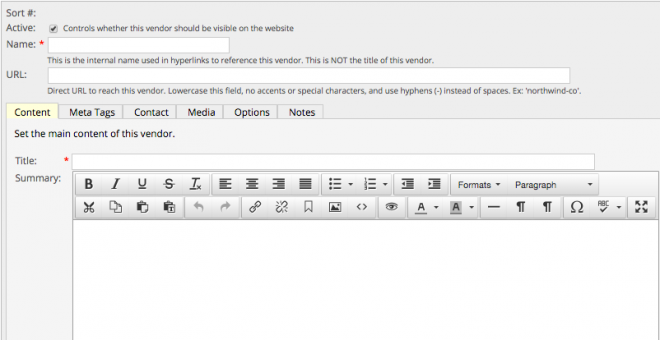 Summary – Enter a vendor summary to display on the website. Body - Enter a more detailed vendor description. Open in Page - Override default, if desired. Add notes related to the vendor. Notes are for internal use only and are not shown on the website. Click Add New next to the Vendor field. Enter a Name and Title (see instructions above) in the dialog box, and click OK. Existing vendors can be modified in the Product Editor screen by clicking Edit.